What Makes Motorcycles So Difficult for Motorists to See? Motorcycles appeal to people with a thirst for adventure, giving them the chance to feel the sun on their back and the wind in their face as they cruise down the highway. However, with only their riding gear and a helmet to protect them, motorcyclists can face serious injury in the event of an accident. Even if motorcyclists follow the rules of the road and make every effort to be safe and conscientious, accidents can and do still occur. In many cases, these accidents are caused by automobile drivers rather than the motorcyclist. When this happens, it's not unusual for automobile drivers to tell investigators that they never saw the motorcycle or motorcyclist before the collision. Motorcycles may inadvertently travel in other vehicles' blind spots. Motorists often instinctively look out for other cars on the road but not necessarily motorcycles. 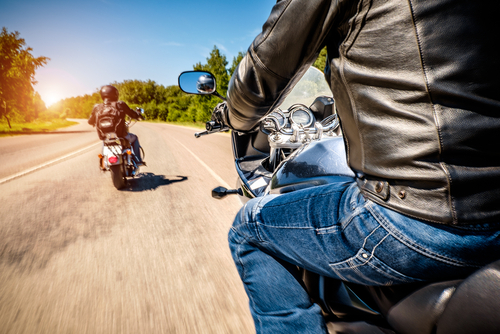 Drivers may be more conscientious about looking for motorcycles in the warm spring and summer months, but they may not expect to encounter them on the road in the fall or winter. Motorcycles of a darker color may appear to blend into the background. Motorcycles have a smaller profile than other vehicles, which may make them hard to spot. Vehicle drivers may have trouble determining the speed of a motorcycle. Motorcycles may appear farther away than they actually are. Motorcyclists are often forced to maneuver around potholes and debris, which may make them seem to appear out of nowhere. Motorcyclists can reduce their risk of accidents by taking steps to make their motorcycle more visible to other motorists. However, there is always the risk of an accident when vehicle drivers and motorcyclists share the road. If you were hurt in a motorcycle accident, you may be entitled to compensation. Having an experienced injury attorney by your side can increase your chances of a successful claim. Contact the knowledgeable attorneys at Steinberg Injury Lawyers today for a free case evaluation.